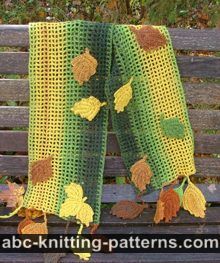 "Stopping by Woods on a Snowy Evening" is one of my favorite poems by Robert Frost, and as we've been having a snowy cold spell for the past couple of weeks, I was inspired to make this scarf as a tribute. 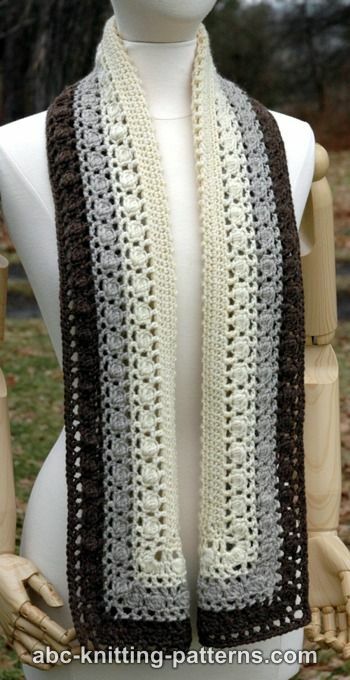 The color choice -- natural, oatmeal and brown -- represents the woods in the wintertime. The bobbles represent snowflakes. 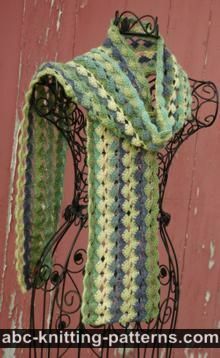 The finished scarf is both lightweight and warm. 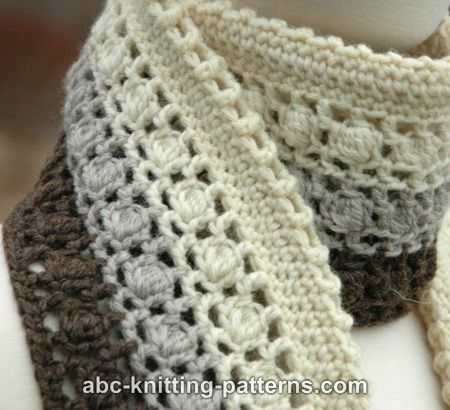 It has something of an usual construction technique, though I've used something like this in other patterns of mine: the scarf is crocheted in rounds from the center outwards, starting with a long chain. 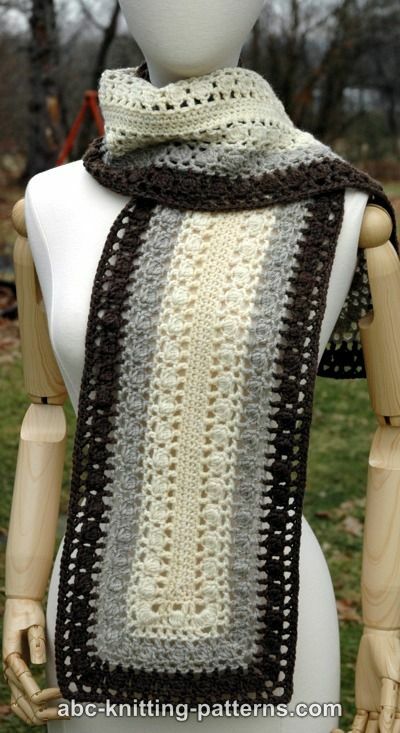 I think this has the advantage of very neat, uniform edges on every side of the scarf. 4dc-bobble – yo, insert hook into st and pull up a loop, yo, pull through 2 loops, (yo, insert hook into same st and pull up a loop, yo and pull through 2 loops on hook) three times, yo and pull through all 5 loops on hook. 5dc-bobble – yo, insert hook into st and pull up a loop, yo, pull through 2 loops, (yo, insert hook into same st and pull up a loop, yo and pull through 2 loops on hook) four times, yo and pull through all 6 loops on hook. 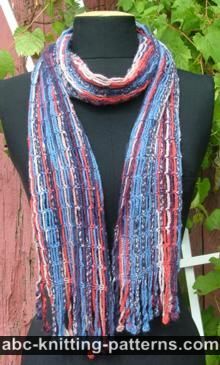 The scarf is worked in rounds from the center out, with 2 color changes. Chain 181 (multiple of 4 + 1). 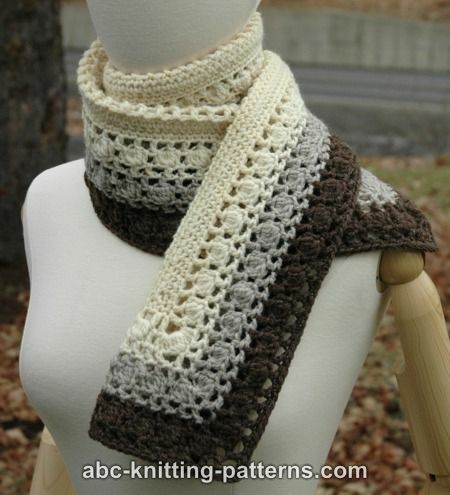 If you would like longer or shorter scarf, add or subtract multiples of 4. Round 1: ch 1 (counts as 1 sc), 1 sc in each ch to the last ch, 5 sc into the last ch, 1 sc into each ch on the other side of the starting ch, work till last ch, 4 sc into last ch, sl st to ch-1. Round 3: ch 4 (counts as 1 dc and 1 ch), skip 1, [*1 dc in next sc, ch 1, skip 1, repeat from * to corner st, (1 dc, ch 3, 1 dc) into corner st, ch 1, 1 dc in next sc, ch 1, skip 1, 1 dc in next sc, ch 1, (1 dc, ch 1, 1 dc) into corner st, ch 1] repeat one more time, 1 dc in next sc, ch 1, skip 1, sl st to ch-4. Round 4: sl st to ch-4 (2nd sl st), ch 3, 4dc-bobble in next dc, [*1 dc in next ch-1, ch 1, skip next dc, 1 dc in next ch-1, 5dc-bobble into next dc, from * repeat to last dc before corner V-st, 1 dc in next ch-1, ch 1, (3 dc, 5dc-bobble, 3 dc) into ch-3, ch 1, 1 dc into next ch-1, 5dc-bobble into next ch-1, 1 dc into next ch-1, ch 1, (3 dc, 5dc-bobble, 3 dc) into ch-3, ch 1, 5dc-bobble into next dc, 1 dc into next ch-1, ch 1, skip next dc] repeat 1 more time, sl st to ch-3. Round 5: sl st to top of 5dc-bobble, ch 4 (counts as 1 dc and ch 1), [*1 dc into next ch-1, ch 1, skip next dc, 1 dc into top of 5dc-bobble, ch 1, skip next dc, from * repeat to ch-1 before corner bobble, 1 dc into this ch-1, ch 1, 1 dc into 2nd dc, ch 1, (1 dc, ch 3, 1 dc) into ch-3, ch 1, 1 dc into 5th dc, ch 1, 1 dc into next ch-1, ch 1, 1 dc into top of 5dc-bobble, ch 1, 1 dc into next ch-1, ch 1, 1 dc into 2nd dc, ch 1, (1 dc, ch 3, 1 dc) into ch-3, ch 1, 1 dc into 5th dc, ch 1, 1 dc into next ch-1, ch 1, 1 dc into top of 5dc-bobble, ch 1, 1 dc into next ch-1, ch 1] repeat 1 more time, sl st to ch-4. 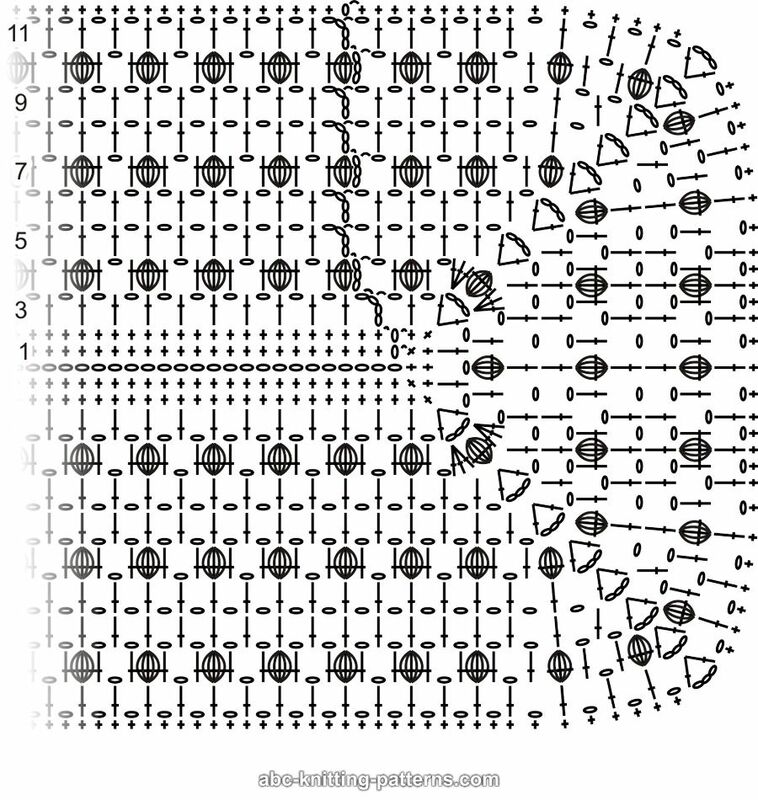 Round 6: ch 4(counts as 1 dc and ch 1), [*1dc in next dc, ch 1, repeat from * to corner V-st, 1 dc into 1st dc of V-st, ch 1, (1 dc, ch 3, 1 dc) into ch-3, ch 1, 1 dc into 2nd dc of corner V-st, ch 1] repeat 3 more times, *1 dc in next dc, ch 1, from *repeat to the end of the round, sl st to ch-4. 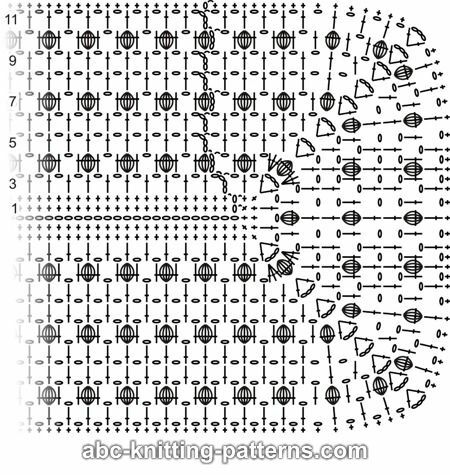 Round 7: ch 3, 4dc-bobble in the same st, [*1 dc in next ch-1, ch 1, skip next dc, 1 dc in next ch-1, 1 5dc-bobble in next dc, from * repeat to ch-3 of corner V-st, (1 dc, ch 3, 1 dc) into ch-3, 5dc-bobble into next dc] repeat 3 more times, *1 dc in next ch-1, ch 1, skip next dc, 1 dc in next ch-1, 1 5dc-bobble in next dc, from * repeat one more time, 1 dc into next ch-1, ch 1, skip next dc, 1 dc into next ch-1, sl st to ch-3. Round 8: sl st to top of 4dc-bobble, ch 4 (counts as 1 dc and ch 1), [*1 dc into next ch-1, ch 1, 1 dc into next 5dc-bobble, ch 1, from * repeat to corner ch-3, (1 dc, ch 1, 1 dc) into ch-3, ch 1, 1 dc into 5dc-bobble, ch 1] repeat 3 more times, *1 dc into next ch-1, ch 1, 1 dc into next 5dc-bobble, ch 1, from * repeat one more time, 1 dc into next ch-1, ch 1, sl st to ch-4. Round 12: ch 1 (counts as 1 sc), 1 sc into ch-4, *1 sc into next dc, 1 sc into next ch-1, from * repeat to the end of the round, working 4 sc into corner ch-3. Sl st to ch-1. Tie off. 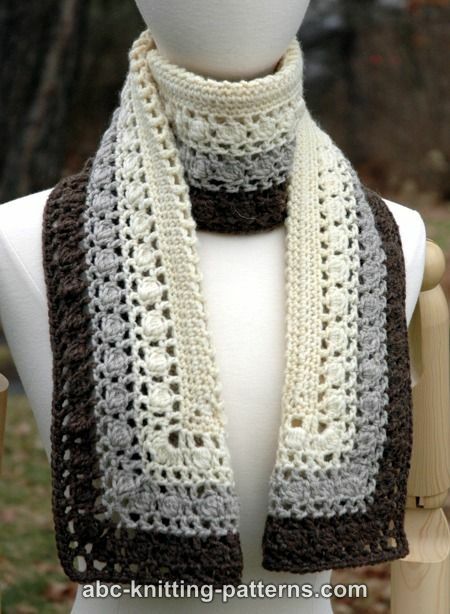 Do you have a YouTube channel where you make this scarf?